Busy here in SoCal for the weekend, and heading back up to Monterey tomorrow on the Coast Starlight. So this post will have to suffice for Sunday and Monday. I'm sure you all can manage. Bart Reed of the Transit Coalition was on LA CityView earlier this week defending the pro side on Prop 1A against Joel Fox, former head of the Howard Jarvis Association and predictable train hater. Click "Roundtable 48" to see the video. Reed made an excellent case for Prop 1A. Definitely worth watching. I'll have more detailed responses to Joel Fox's claims in a post later this week. Cathleen Galgiani was the subject of a positive piece in the Stockton Record about her work in getting AB 3034 shepherded through the legislature. This bill was originally going to be carried by Fiona Ma, probably the best HSR advocate we have in Sacramento, but when Ma's legislative calendar got too full she handed it off to Galgiani, whose persistence helped get the bill passed. This blog hasn't been totally supportive of Galgiani's approach to HSR, as we disagreed with her efforts to weaken the LA-SF "spine," but she has become a key HSR figure in the state and deserves to have her fine work recognized. Anything else you guys want to discuss? Put it in the comments. Enjoy the rest of your holiday weekend, everyone. William Garrison says there is little national demand for high-speed rail. He says the push for high-speed rail is merely a new way of doing something old. "While the high-speed trains look nice, they're just polished-up, old, sterile technology," he says. "They're like I am. I am an old man with a new haircut." It's conceivable that Garrison has not been to Europe or Japan anytime in the last 30 years to see the cutting-edge, extraordinarily popular high speed trains there. It's possible, I guess, that he hasn't even been to the western edge of his city to see the frequent, high-ridership Capitol Corridor trains. And it's more than possible, but quite likely, that he's just an old-school freeway builder who convinced himself in the 1960s that rail was dead and 40 years later cannot bring himself to admit new evidence and new realities. Major themes of the book include the pervasiveness of conventional wisdom, its often unfortunate role in shaping policy, and the need to resist it. Another theme is historic path dependence, in which initial decisions when a technology is young lock systems into development paths out of inertia (as in the case, say, of railway gauges), so that they become historic artifacts rather than dynamic transport systems. The authors also address the maturity of our transportation system (and its possible senescence). That creates the danger that new ideas will be suffocated or starved, especially given the present preoccupation with polishing and fine-tuning obsolete systems, or tinkering around the edges, refining and optimizing in small increments what is already deployed. Despite this undercurrent of dismay, the authors claim to be writing out of a sense of optimism. "We need to think harder. We need to do better," they write, with the implication that that is possible. At the same time, the authors suggest that the passenger railroad is a dying technology, suitable for a select few settings, but extremely limited in its practical usefulness overall. They analyze the prospects for high-speed rail in the U.S. market and, contrary to some widely publicized views, conclude that it is not likely to succeed on its own merits. In the two places where high-speed rail has enjoyed some of its greatest success, Europe and Japan, other factors contributed to the outcome. Regulatory schemes artificially inflated airfares, so airlines could not compete for customers on price. And because Europe and Japan are more densely populated and have more severe congestion and capacity problems, high-speed rail has an easier time of matching the convenience of air, creating the high-volume, short-distance market for which high-speed rail is most suited. So how do they explain the Acela's success?! European air travel has been revolutionized by low-cost carriers such as easyJet and Ryanair, but high speed rail has still beaten them. Matt Melzer destroyed the "more densely populated" argument here on the blog last month, showing that Spain has very similar conditions to us in California, and Spain's successes can be repeated here. Finally, the notion that air travel is "convenient" just doesn't seem true any longer - when American travelers are given a choice between flying and high speed rail, they're choosing the rails. Finally, they argue, high-speed rail is too late: "In mature systems, the benefits of new infrastructure in an already well-served area are elusive." Tinkering with an older system will yield only minimal gains. "Whether high-speed rail is a new story, or simply the final chapter to the history of conventional passenger rail, waits to be seen," they conclude. Of course, California is not a "well-served area." HSR isn't "tinkering with an older system" and his implicit notion that passenger rail is headed for some dustbin of transportation history is belied by the reality that surrounds us. Ultimately Garrison's argument is really little more than libertarian anti-transit nonsense dressed up in academic speak. Their book purports to explain why "the math" doesn't work for transit, but this ignores the massive subsidies given to freeways - meaning "the math" doesn't work for them either. And nowhere in their book, published in 2006, do they discuss the impact of higher gas prices or global warming mitigation costs on transportation - both of which suggest that HSR will be effective from both a transportation and an economic point of view. Garrison's arguments are the last gasp of a dying 20th century model. The 21st century model is one that emphasizes sustainability, in our case through modernized passenger rail. I love riding the Coast Starlight, but give me high speed rail and I'll choose that over Amtrak, driving, or flying any day. Jada Golden stood in the waiting lounge at Union Station, explaining why Amtrak is a better way to travel than an airline. "It's as heavy as we want," Golden said, pointing to an oversize suitcase. "We can put it on a rack in the rail car and get things out of it." Golden, 36 and a Boston schoolteacher, pointed to another bag -- a large paper grocery bag filled with sandwiches, salads, water and fruit. "You can bring food," she said. She continued. On the train, she's free to pick her own seat and doesn't have a flight attendant telling her when to use electronics. And then there's the airline stress factor -- the security headaches and the delays. "You're always delayed in the airport," Golden said. "You always have connecting flights." Security theater, high fuel prices, an aging infrastructure, and corporate nickel and diming are all driving passengers away from planes and to the trains. On the Acela passengers are free to talk on their cell phones, getting work done that they couldn't get done on a plane. It's a superior method of travel, as more and more Americans are discovering. Of course it helps that the Northeast Corridor has something like the Acela, a quasi-high speed train that is competitive with flying times between DC and NYC. Here in California we just don't have that option. The Coast Starlight, which I'm riding to LA tomorrow, takes about 12 hours to get from the Bay Area to SoCal. There's just no way that can ever shift travel habits in any lasting or meaningful way. I love riding it, but most Californians can't afford to take two whole days to get between LA and SF. Compared against the Coast Starlight, yeah, flying is generally the better option. And that's where high speed rail makes such an enormous difference. Two and a half hours on a train is certainly competitive with flying, especially when the security theater, travel time to and from the airport, waiting in the terminal, and frequent flight delays are considered. You can conduct business on the train, with a cell phone and likely by wi-fi once our project is built. It provides a stable cost of transportation, as opposed to flights which are dependent on an ever-rising cost of oil. Already airlines are cutting flights between LA and SF, which is likely to continue as fuel costs eat into profit margins. To believe we can rely on airlines to handle our intrastate travel needs is to deny reality. Americans are already demonstrating that they WILL take high speed rail if it's an option, just as Californians are riding the Amtrak California lines in massive numbers. Put together it's a solid argument for high speed rail in California. Now that Prop 1A is going to be on the ballot we're starting to see groups take sides on the issue. Outside the far-right anti-government groups like the Howard Jarvis Association most California political organizations will endorse it, and I'm not going to post about it every time that they do. But the first one that came up is from the California Alliance for Jobs and I thought it was worth dwelling on this for a moment. The California Alliance for Jobs is a coalition of construction unions, many of whom will benefit from the high speed rail project. So their support isn't going to be a surprise, and some will just dismiss them as self-interested, that they just want jobs for their workers. Of course they do. And so should we. California's unemployment rate is 7.3% - a 12 year high and the 4th highest rate in the nation, only bested by states in truly dire straits like Michigan. That unemployment rate is going to grow worse over the next few years, and one of the hardest hit sectors has been construction. High speed rail will bring around 160,000 jobs to that construction sector right when those jobs are most desperately needed. 160,000 construction jobs means more spending in restaurants and small businesses, more tax revenue, and ultimately a far more significant economic boost than the tax rebate checks that came and went without any noticeable effect. The Authority projects over 400,000 permanent jobs will be created as a result of HSR. California has often turned to infrastructure projects to help carry the state through tough times. We built the Bay Bridges in the depth of the recession. The State Water Project was approved during the late 1950s recession. Similar projects have been done around the country and around the world. And those bridges and aqueducts weren't just make-work projects. They built lasting value. They anticipated the state's future needs and 50, 70 years later they still help our economy function. But we have new needs. We need fast transportation that is independent of oil and runs on renewable energy (more on the CHSRA's study tomorrow). We need a way to provide transportation that is free from the soaring and unpredictable costs of driving or flying. We also need to cut back on carbon emissions that are threatening the basic functioning of our society through the global warming they produce. We've already wasted time. This project should have been voted on in 2004 or 2006. Instead it finally comes in 2008. In that time other countries have passed us up, building for the 21st century while we sit here and delude ourselves into thinking the 20th century is still viable. If we are to have economic growth over the next few years, and economic growth over the next few decades, we need to build high speed rail. It won't solve those problems itself. But it'll help get us there. So I'm glad to stand next to the construction workers in supporting high speed rail - because we are ALL going to benefit from this project. And we will ALL pay more and have less if we don't get Prop 1A passed in November. Even though everyone believed Sunday was the real drop-dead date to modify the fall ballot, the governor's office believes "we have a few days left" - and so Arnold will drop his petulant "I'm not signing anything until there's a budget" and will sign AB 3034 today. Presumably this really does mean Prop 1 will be replaced with Prop 1A. Guess we're gonna have to change the stationery. "Any measures that must be placed on the November ballot must be acted upon quickly," the governor said in a letter dated Monday to legislative leaders. "I urge you to send me these measures that must be placed on the November ballot immediately." The governor had repeatedly vowed to veto any bills sent his way until lawmakers agree on a state budget, now 57 days late. He changed his mind because "the governor believes that Californians should have the opportunity to vote on these specific measures," said his press secretary, Aaron McLear. Quentin Kopp had already given up on AB 3034 and put out a statement yesterday stating that the Authority planned to adopt "most" of the AB 3034 recommendations. Now it seems like that's been superseded by AB 3034 itself. As we explained last week this has been a sorry business with the legislature and the governor both failing to move quickly and effectively on the bill. One huge question mark is the updated business plan - AB 3034 mandates it be released by September 1, which is six days from now. Hopefully the Authority has been working on it, but I doubt anything they produce will satisfy the usual HSR deniers. David Grossman is USA Today's business columnist, a former airline exec and a California resident - and today he offers not one but two columns extolling the benefits of rail for business travelers, especially high speed rail. It's best to read these in sequence to get the full effect of his argument. First up: Is Amtrak a viable solution for business travelers? But that is only the Northeast corridor. In California, where I reside, and most other parts of the country, Amtrak is a completely different product offering. In the Northeast, trains attain operating speeds of 125 to 150 miles per hour, according to Black. On the 423-mile stretch between Oakland and Los Angeles aboard Amtrak's daily Coast Starlight train, the scheduled travel time is more than 13 hours. Though the train reaches 79 miles per hour on some segments, the average speed on this day-long marathon ranges between 25 to 35 miles per hour. Slow travel speeds are caused by a combination of mountainous terrain and sharing the tracks with freight trains. Outside the Northeast corridor, freight railroads generally own the tracks. In most places double tracks have been removed because they are too costly to maintain. As a result Amtrak must continually wait on sidings for other trains to pass, and the freight trains operated by the host railroads that own the tracks often take priority over passenger trains. My train sat for what seemed like hours at many places along the way and at one point was delayed 30 minutes after we rammed a shopping cart someone left on the tracks. With all these impediments it is no wonder few business travelers use Amtrak outside the Northeast corridor. Grossman goes on to explain some of the problems he experienced on the Coast Starlight, problems that will be familiar to any of us who have used the trains before, from the late arrival time in LA to the lack of electrical outlets at all seats. But his main point is that speed and reliability are the key to make rail attractive to business travelers. Passengers fill every seat in the glass-roofed Parlor Car on Amtrak's Coast Starlight train en route from Oakland to Los Angeles. Running along the Union Pacific Railroad tracks as it hugs the California coast, the Coast Starlight route offers some of the most spectacular scenery in the USA. But the mountainous terrain along the route is filled with steep grades, sharp curves, and a single track, making the travel time over 13 hours for a distance that can be flown in one hour or driven in eight. Unless Amtrak can find a way to shorten the duration of this trip, few business travelers will abandon the crowded skies or leave their cars at home. This November, Californians will vote on a proposition to construct a new dedicated high speed rail line to bypass this slow but scenic route. If it passes, the new rail line will run across the open flat lands of California's Central Valley, allowing passengers to travel between the San Francisco Bay area and Los Angeles at speeds up to 220 miles per hour, rivaling the famous French TGV or Japanese bullet trains. The new line would link California's two largest cities in just a few hours of travel time. An obvious first point is that it's not just business travelers who will benefit from this, but all travelers period. Still, Grossman clearly applies the lessons he learned on his Coast Starlight trip to high speed rail - HSR solves all of the problems of the Starlight, by providing dedicated tracks to allow fast trains to speed travelers from one end of the state to the other in convenience and with modern conveniences that make a trip far more efficient than a flight or a drive. The price tag for this new rail line: $10 billion, and there's the rub. To further compound the issue, that $10 billion would likely only cover the construction of one line from the San Francisco Bay area to Los Angeles. Add in California's other population centers like San Diego, Sacramento and other cities and the final price tag will be considerably higher. As we know, $10 billion won't be enough to cover the cost of the SF-LA line. That's more like $42 billion, and California is going to need federal assistance to make it happen. Still, columns like Grossman's in a major national newspaper certainly help that cause. The proposal has sparked numerous fights within the state. There are many vocal opponents to the high speed rail project while others want to amend the proposition before it is even voted upon. Critics and those with a self interest in keeping the status quo maintain that America's suburban sprawl is different from Europe or Japan and that the trains will travel empty along the high speed route. But past evidence would suggest otherwise. Since Amtrak beefed up its service in the Northeast corridor with the launch of the high speed Acela trains, their market share has grown fourfold, from 12% just a few years ago to more than 50% of the air/rail market in the Northeast Corridor today. And a huge proportion of those Acela riders are business travelers. Of all the money-losing routes on the Amtrak network, the Northeast corridor is the one exception and a similar high speed service in the most populous state on the other side of the country would likely garner the same effect, relieving much of the congestion on the roads and in the skies that are the bane of California. Grossman absolutely nails it here - I especially love his jab at "critics and those with a self interest in keeping the status quo." Because that's what those who oppose Prop 1 are inherently saying - that the way things are in California is just fine, there's no need to change, no need to build for the future. All is well! And his use of statistics is quite effective, even if I'm not sure about the 50% share - the Acela was at 41% back in March, but the gas price spike may have driven the Acela's numbers even higher. In any case, the Acela is proof that high speed rail can work in the US - especially since Acela isn't true HSR. If high speed rail is implemented correctly, as has been done in many European countries with rail lines running right into airport terminals, transfer from plane to train will be seamless and render the need for flights of less than 500 miles unnecessary in most cases. The California HSR project gets this mostly right. There'll be stations at Millbrae/SFO, Palmdale Airport, Burbank (a mile from Burbank Airport), Ontario Airport, and as is being discussed in the previous post, perhaps one at San Diego Lindbergh. Obviously something needs to be done about LAX, but that's a regional solution, not something HSR alone can fix. The fuel and emissions savings of electrified rail lines would be enormous and the productivity gains amassed from unclogging our skies and highways would be substantial if such a national high speed rail network could be implemented and fully integrated with the existing air transport system. But this vision is way out there and it might have to happen one state at a time. I don't know if a majority of Californians will support the high speed rail initiative this fall, but as the saying goes, "as California goes, so goes the nation." So if high speed rail catches on here perhaps the rest of the country won't be far behind. Well said. As polls continue to show a majority of Californians do support Prop 1, we may just provide the leadership that has otherwise been lacking in this country. The status quo is not viable. If American business is to prosper, it needs a high speed boost. There are a lot of business folks who travel between LA and SF, and many of them frequently tell me they'd love a high speed train connection rather than fighting the airports and losing time that they might otherwise productively use. So it's wonderful to see a major paper like the USA Today getting it right, and pushing out some common sense, obvious truths that will hopefully build nationwide support for high speed rail. To allow the high speed trains to safely flash through the Caltrain corridor means numerous design challenges, some of which residents may not like. Trickiest of all is downtown, where there is little room at the train station for two additional tracks. As for Castro Street, either a grade crossing must be built or the street will be closed off. "Something has got to give or something has to go up or down," said Bob Kagiyama, senior public works engineer. That something could be Castro Street itself, which, according to an old city report, would have to be below-grade for half of Castro's historic 100 block if it were to go under the train tracks. This is the same issue that wealthy homeowners in Menlo Park and Atherton claim as grounds for a lawsuit, but Mountain View is instead trying to plan ahead and open up a public dialogue on what the best solutions will be, that will both integrate high speed rail and Caltrain service with the city's landscape. Despite all the speculation, city officials say it's way too early to say exactly what will happen in Mountain View. To have the new rail line tunnel under the whole downtown area is a very expensive solution, Kagiyama said. And going overhead "isn't going to happen." Also, Rengstorff Avenue and Central Expressway could be lowered to allow cars to pass under both Caltrain and the high speed rail tracks, which would remain at-grade. The High Speed Rail Authority would likely pay for the expensive projects, which could relieve the city of a heavy fundraising burden for the Rengstorff crossing. But the City Council made the Rengstorff grade separation a top goal earlier this year -- with no talk of high speed rail paying for it -- and funded preliminary studies on the project. The city aims to make the intersection safer. Kagiyama said the city is anxious to talk to a contractor being hired within the next few weeks by the High Speed Rail Authority. This contractor would do local design work, and the city is eager to begin ironing out local concerns, such as the downtown train station's replica 1887 Train Depot and the light rail tracks, both of which may have to be moved. The Peninsula is likely to be one of the most expensive parts of the project owing to the grade crossings required, and determining financial arrangements is going to be a central part of the project's politics after November. By starting to think about this now, cities like Mountain View are going to save themselves and the CHSRA time and money - there will already be detailed studies and a public process. It's especially important that this work start now in order to build public support not just for HSR, but for specific solutions in cities like Mountain View. Such support is best built with frequent consultation with residents and an open planning process. Many hard decisions are going to have to be made about where the tracks and grade crossings will go and a consistent process can help reduce tensions and frictions. Rather than fight reality and pretend that a 1950s-era urban landscape is tenable, Mountain View is looking to the future, to a sustainable mass-transit future. They're not alone - cities like Fresno are making similar plans. Most cities along the proposed route support the project and some, like Visalia, wanted it so badly that they tried pressuring the Authority into giving them a station. It's good to see that California's cities want a better future, rather than deluding themselves that the past is still viable. As Barack Obama finally announces his vice-presidential pick, Delaware Senator Joe Biden, there's been a lot of discussion about how he reflects or complements or even detracts from what Barack Obama stands for. Most of those discussions focus on the war in Iraq, domestic economic policy, the nebulous media fiction of "gravitas," etc. But there's a key area where Biden and Obama are not just in agreement, but have been outspoken leaders: trains, and high speed rail in particular. Obama has already made a name for himself as a high speed rail advocate, as we've previously discussed at this blog. Obama now adds to his ticket one of the most committed supporters of Amtrak and a high speed rail proponent in Joe Biden - or as Atrios calls him, Vice President of SUPERTRAIN. Biden vowed to remain a fixture in his sons' lives. Valerie became their surrogate mother, and Biden began the daily commute from Wilmington to Washington that made him an Amtrak champion for life. Even after Biden met and married his second wife, Jill, five years later, he didn't surrender the back-breaking schedule. "Kids keep a thought in their heads for 12 hours," he says at one campaign stop. "They aren't gonna keep it for 24 hours." A lead author of the legislation, Senator Joseph Biden, Jr. (DE) said, "Every advanced economy in the world invests more than the United States in high-speed inter-city service. We like to think of ourselves as the most advanced country in the world, and I believe we are, but for years we have nickel-and-dimed passenger rail service in this country." Biden explained the broad support for the legislation, stating, "We have the support of the many members all across the country because our country's transportation system is already stretched to the breaking point." Biden proposes an interstate high-speed rail service similar to the interstate highway system. “One mile of one lane of I-80 costs $22 million,” Biden said. “One mile of I-95 (on the East Coast) holds more traffic and costs $41 million.” By contrast, “One mile of high-speed rail costs $1 million. Biden said the reason why railroads haven't been used more in the past is because of special interest groups, most notably the airline industry. “They get $350 million a year to go where no one wants to go,” Biden said, qualifying that by saying that there is not enough business to support a commercial flight. He said people don't like the idea of subsidizing railroads, yet the airline industry gets subsidies to fly to sparse locations. Whether you plan to vote for the Obama-Biden ticket or not, it's clear that they do have the possibility to dramatically raise the profile of high speed rail in America. They also "get" high speed rail and why it is so fundamentally important to the future of this country. I can't imagine a better boost for our own HSR plan than to hear one of them mention it in a debate or a nationwide TV ad. Picking Biden also has some political drawbacks. If the ticket is successful in November, one of Amtrak's and HSR's most important backers will leave the US Senate for the Executive Branch. It's possible that Biden could do for Obama what Lyndon B. Johnson did for John F. Kennedy, and use his masterful knowledge of the Senate to be the president's de facto Senate lobbyist and "fixer." Unfortunately it's also possible that Biden won't be able to play as strong a role for high speed rail as he might have while still a sitting US senator. Despite that potential problem, the Obama-Biden ticket is still much better for high speed rail advocates than the alternative. John McCain is an noted Amtrak hater and has shown little love for HSR. It's hard to envision a McCain Administration accepting a large budget appropriation from Congress for California's HSR project, and that might set things back five years. Not having Biden in the Senate to advocate for HSR would be unfortunate, but having McCain in the White House to block it would be far worse. Don't really have time to put together a proper post today, and won't be able to put something up until later tomorrow afternoon. So use this as an open thread, but I would love to hear answers to this question. How would you promote the high speed rail project aka Prop 1 to your fellow Californians? What sorts of campaign appeals would work with you, and what would fall flat? How can we improve the public's awareness of HSR, given that the July Field Poll found 78% of Californians weren't aware of the plan? We have to also consider that the traditional media, particularly the newspapers, will be against us. Grassroots activists, along with the official campaign, are already working on HSR activism, so I'm not using this as a sly way to drum up ideas. Instead I'm genuinely curious. How do you think we can get Californians to care about high speed rail? According to the Secretary of State's office, Sunday August 24 is the real, true, absolute drop-deadline to put AB 3034 on the ballot as Prop 1A. Apparently county election officials are under pressure to move ahead with ballot printing and can't delay much further. It is possible, depending on exactly what the Legislature does over the next few days and how they do it, that we could see two high speed rail propositions - 1 and 1A. That needs to be avoided. At this point I don't much care whether AB 3034 becomes law or not - it doesn't make any vital changes to the project; the original Prop 1 is a good plan; and the core arguments for HSR aren't affected by the fate of AB 3034. But it would be bad for HSR if there are two measures on the fall ballot - confused voters are No voters. Of course this is probably all moot, since it's highly unlikely that there will be a state budget agreement by Sunday - and without a budget, Arnold won't sign any bills. The budget impasse is as deep as ever - for more read my overview from Calitics this morning. Republicans have backed themselves into a corner with their "no taxes" pledge, and would risk their own seats at the next primary by breaking it. A government shutdown is a possibility, although some ways off. Unless something unexpected happens, AB 3034 looks to be dead. And that leads me to wonder whether the push to change Prop 1 had any use, or whether it was a waste of time and effort that should have instead gone to HSR advocacy. This blog started focusing on AB 3034 rather late in the game, even though it was the subject of the first post here, and even when we did discuss it, my view was mostly skeptical and wary. Only when Leland Yee moved to secure the "spine" back in June were my own concerns eased, and from that point on it was mostly a drawn-out legislative battle exhibiting some of the reasons why our state legislature is becoming a failed institution. AB 3034 wasn't a total waste though - its ups and downs, especially in the last two weeks, did draw some attention from the traditional media to the high speed rail project, mostly favorable coverage. That always has value. As we move into the general election campaign in earnest, we can certainly use as much coverage as we can get. If there's a lesson here it's that California legislators need to pay more attention to high speed rail, take it more seriously, and show some leadership on it. And perhaps the AB 3034 debate helped accomplish that as well. Looking back over this post it reads like an obituary. But I don't think rumors of its demise are exaggerated, although we won't know for certain until Sunday. Getting the high speed rail bonds are what matter now, no matter what the proposition's number on the fall ballot. However, voters are more concerned with the cost of living than with the environment, according to a poll commissioned by industry-lobby group Flying Matters last year. Flying Matters appears focused on promoting Heathrow expansion so their claims aren't surprising. And they may not be wrong. Certainly here in the United States we don't have to strain to see examples of people seeing this as a choice between keeping a low cost of living or helping the environment. We can expect the HSR deniers to continue arguing that HSR will cost Californians too much money as part of their effort to kill the project. But it shouldn't have to be a choice. In fact, it is a false choice. High speed rail is a perfect example of this, because it shows that the environmental option IS the the low cost of living option. Sure, gas prices are on the temporary downswing, but they will continue to rise over the long-term. By the time high speed rail opens around 2018, it will likely be the more affordable option than driving or flying. Even if gas prices increase at a slower rate, it will still be affordable anyway, create jobs, and promote business development. Nor should we forget the environmental benefits, which also save money in the long run in reduced pollution, reduced carbon emissions, and reduced oil consumption. The notion that helping the environment was an economic loser was never an accurate claim, but it holds even less water than usual with regard to high speed rail. High speed rail benefits both the environment and the economy. In fact, it's probably time we started seeing the two as fundamentally linked. We who support high speed rail here in California would do well to emphasize those connections. The farebox recovery revenue-to-cost ratio for July is 64.9% (an all time high), and the year-to-date revenue-to-cost ratio is 55%. I'm sure there are still some deniers out there who will argue that HSR will have trouble attracting riders, but if the comparatively lesser Amtrak California services are witnessing huge ridership growth, surely HSR will thrive in CA just as it has everywhere else in the world it's been adopted. These numbers are impressive, but they're about to hit a ceiling. Arnold Schwarzenegger's administration has been slow to release Prop 1B bond money for new cars, and on the Capitol Corridor and Pacific Surfliner trains, it's not uncommon to encounter standing-room only crowds. And of course the routes have inherent physical limitations in that the state doesn't own the tracks, meaning expanded services and faster travel times aren't yet possible. Of course, these intercity services don't provide the speed that most intrastate travelers want. If we're going to give Californians a viable alternative to increasingly expensive and yet less available flights, it's time we got started with high speed rail. But the Howard Jarvis Taxpayers Association would prefer you not know that. Stung by one of the highest state tax rates in the nation, Californians soon could be paying even more if officials and voters approve an array of new bond measures and taxes now under consideration. Already on the November ballot are nearly $17 billion in statewide bonds, ranging from $9.95 billion for a high-speed passenger train system linking Southern California to the Bay Area, to $5 billion that would give motorists cash rebates for buying fuel-efficient vehicles. Two problems here: first, Californians do NOT pay one of the highest state tax rates in the nation. According to the California Budget Project we rank 13th in state taxes and 18th in state plus local taxes. That hardly qualifies as "one of the highest state tax rates in the nation" but the claim goes uncorrected. The second problem is the implicit equation of a bond measure with a tax increase. Rod Diridon is famous for saying "this project won't raise your taxes" and while it's not what I would say, neither is he technically wrong - there is no tax increase written into Prop 1(A). Depending on how the state resolves the current budget crisis it is possible that there will be extra money to pay the annual debt service - and the state Legislative Analyst has said we can afford that debt. It's possible that Prop 1(A) might lead to higher taxes, but it's not certain, and depends on a whole host of factors. Those who claim it WILL raise taxes are assuming certainty where none exists. "What's happening is the taxpayers are under assault like we've never seen before," said Jon Coupal, president of the Howard Jarvis Taxpayers Association. "We have not seen an assault on taxpayers of this magnitude since the tax revolt leading up to Proposition 13 three decades ago. "Our elected leadership, at both the state and local levels, is pushing California into the 'coveted' position of the highest-tax state in America. If that happens, it will be economic suicide for the Golden State." Seeing as we're currently at 18th in state and local taxes, it would require one hell of a tax increase to put us up to #1. But what's more important is their delusional argument that taxes will cripple California. That's only true if you assume that the taxes vanish into a black hole, never to emerge in any form again. But with the HSR bonds, as with other mass transit proposals like SMART or the LA Metro sales tax, that's just not so. High speed rail will produce immediate and long-term economic benefits while saving Californians money. The California High Speed Rail Authority has estimated that the cost of expanding freeways and airports to meet the demand HSR would serve is between $80 and $150 billion - from twice to four times the cost of HSR. HSR is therefore a savings over those alternatives. Of course, California taxpayers will save money once the system is open through cheaper fares than what airlines and gas stations can offer. As we've pointed out before, the long-term gas price trend remains upward, and by 2018 it's likely that oil prices will be substantially higher than they are now. Even if Prop 1(A) were to be paid for by new taxes, it'd be around $525 per person *total* ($19 billion in bond principal plus interest, divided by 36 million Californians). If the bond life is 40 years, as AB 3034 directs, that comes out to $13 per year per Californian. If a Californian travels between the northern and southern halves of their state at least once a year using HSR they're likely to save more than $13 a year, and likely to save much more than $525 over the life of the bonds. Finally, HSR will create jobs. The current estimate is 160,000 construction jobs and 450,000 permanent new jobs will be created by the project. As Atrios, a longtime fan of our project that he calls "SUPERTRAIN", noted today that's a badly needed economic stimulus in a country that has lost 800,000 construction jobs. California now has the fourth highest unemployment rate in the nation at 7.3%, behind Michigan, Rhode Island, and Mississippi. 160,000 new construction jobs would be an ENORMOUS boost to this state at a time when we desperately need new employment. What prosperity California still has today is the product of past public spending - the bay bridges, the freeways, the aqueducts, the universities. All of those were paid for by taxes, and Californians reaped the rewards. But those investments need to be renewed, in a way that suits the new conditions of the 21st century, specifically energy, environment, and climate. High speed rail accomplishes all those wonderful things. The Howard Jarvis Association would prefer California voters know none of this. In their mind all taxes are bad, as is the government spending the taxes support. In a state with a decaying infrastructure and a sky-high unemployment rate, partly due to the Association's successful 30-year war on government, you wonder why anybody would listen to them. Via the passenger rail blog I discovered a fantastic documentary titled Retraining America (scroll to the bottom of the page; film is a 34 min Quicktime file) made by students at Guilford College in North Carolina. It's a good overview of the state of passenger rail in America, including the history of rail in the 20th century, the rise of freeways, and the starvation diet trains have faced. Matt Melzer, of NARP and a frequent contributor to this site, is featured and as usual he makes some solid arguments about trains in America. He makes the point that America has been "socially engineered" to the point that cars are the only viable form of transportation for most people, leaving them without the freedom to choose another way to travel. Of course, this also leaves them vulnerable to crippling increases in the price of gas, which in turn damages the economy, as we're witnessing right now. The problem we face today is that a transportation system that worked for a while, from around 1960 to 2000, is no longer working. The end of cheap oil and the massive congestion of airports and freeways both indicate the desperate need to give Americans more choices and to guarantee prosperity through a revival of rail. Freeways in particular were the product of a massive federal subsidization effort; roads don't pay for themselves and never have. What the HSR deniers are asking California to do is shackle itself to this failing model. They believe, against all available evidence, that the post-1960 model of freeways and flights is still sufficient for our travel and economic needs. The increasing rail ridership belies their arguments, as does the move of California industries like Salinas Valley agriculture to revive rail freight. Partly for those reasons, alongside the environmental and climate benefits of HSR, I argue that high speed rail is the most important project California has considered in the last 50 years. Just as the bay bridges and the State Water Project were necessary for a prosperous 20th century California, so too is HSR necessary for a prosperous 21st century California. PS: I have added a link at the right to the ActBlue page for the official Prop 1 campaign. Help make high speed rail a reality in California by kicking in a few bucks to the campaign. AB 3034 finally passed the Assembly today on a 54-15 vote. The bill is NOT going to be sent to Arnold Schwarzenegger immediately, though, in hopes that a budget deal will be reached by Saturday. AB 3034 would have been sent to the governor sooner had Senate Republicans not blocked its passage for several weeks, and Bakersfield Republican Roy Ashburn was the central figure in the delay. This blog was extremely critical of Ashburn for these delays. But were we wrong to do so? Here I was all set to blast State Sen. Roy Ashburn, R-Bakersfield, for letting politics get in the way of progress, when common sense and fiscal responsibility got smack in my way. Being the jaded gal I am, I chalked up his apparent Luddite ways to his plans to run for the Board of Equalization when he’s termed out in 2010. No one has a prayer of winning that office with out the blessing of the Howard Jarvis Taxpayers Association and I’d just seen an editorial in the Orange County Register by the Jarvis group repeating Ashburn’s points nearly word for word. Ah HA! I thought. This is just Ashburn feathering his future nest by dumping on the constituents in his current nest. The first phase of the 800-mile train corridor, after all, would be built from Bakersfield to Merced, giving us access to clean rapid transit before the rest of the state. What the heck was Ashburn thinking? Actually, he was thinking about making sure this project comes to fruition responsibly by not getting caught up in the emotion and instead sticking to facts. Facts such as the High Speed Rail Authority’s business plan was last updated in 2000 and they didn’t plan to do a new one until October, meaning anyone voting absentee might not have a chance to dig into the particulars until after their ballot was cast. Under the fix Ashburn advocated, the business plan must be updated by Sept. 1. But if Ashburn was genuinely interested in an updated business plan, why did he wait until July to demand one? He had plenty of time to call for it - AB 3034 was introduced way back in February. He had plenty of time to make his wishes known. Further, his delay meant that the production of a new business plan was also delayed. If he really wanted to give voters the opportunity to "dig into the particulars" shouldn't he have ensured that the bill got passed quickly, so that the Authority could produce the most complete and accurate document possible? Ashburn's delay has jeopardized even the Sept. 1 deadline, since AB 3034 still isn't signed by the governor. And facts such as, under the existing proposition, the authority could stick its hand in the cookie jar and spend that $10 billion willy nilly with little or no oversight. Under Ashburn’s amendments, the authority must request money through the budget process, which means a lot more public scrutiny. I did not realize that was part of AB 3034 - and I am not pleased. Far from a positive move, this could be an *extremely* bad change. Requesting money through an annual budget process is guaranteed to drive up the cost of the project and delay construction. Instead of the Authority releasing funds as contractors need it, to suit a proper and efficient construction schedule, they have to wait on a state budget process that is ALWAYS late. It also makes it difficult for the project managers to plan construction since they can't count on the money always being there. Worse, this makes it possible for politicians to stick their own hands in the cookie jar and mess with the way money is spent, causing inefficiencies and politically-motivated bad spending choices. If Ashburn merely wanted to give, say, an independent commission the ability to disburse the money that'd have been one thing. But what makes him think politicians who haven't solved the state's budget crisis for 30 years are going to be effective stewards of HSR bond money? It's difficult for me to see Ashburn's move here as beneficial for or in the best interests of the HSR project. Few things are more likely to cause delays and cost overruns than an annual budget appropriation. I’d vote for the proposition either way. California must solve our ever worsening air and traffic conditions. But I’m glad Ashburn is asking some tough questions and keeping an eye on the bottom line. I do disagree with Ashburn’s take that the authority has only a vague idea of how the train would operate, its ridership numbers, proposed fares, alignment and technology. Almost all of that has been ironed out in painstaking detail, according to documents on the authority’s Web site and according to Mehdi Morshed, executive director of the authority. That should be a clue that Ashburn really doesn't have the project's best interests in mind. Looking at this in whole - raising objections at the 11th hour, demanding a new business plan and then blocking the bill that would provide it, turning a smooth project funding process into something chaotic and dependent on a broken state budget process, and then demonstrating a lack of knowledge about the HSR operating details - all suggests that Ashburn actually was trying to block HSR, and that the amended AB 3034 isn't as great for the project as Henry believes. We'll see what happens with AB 3034. Either way we, like Lois Henry, will be voting for Prop 1(A). But the issues she raises suggest some of the battles we will have to face after we win that vote. If you thought this blog was going away on November 5th...heh. Not gonna happen. We'll still have plenty of work to do. California has long talked about a high-speed rail line to connect the San Francisco Bay Area to Southern California. After years of chatter about the project, a $10 billion bond measure to start construction will be put to a vote this year. Last month, 62% of voters polled by JMM Research said they would support the bond measure, up from 52% in November. Voters cited having an "affordable" transportation alternative, "reducing dependence of foreign oil" and "reducing traffic congestion" as reasons for supporting measure. "You could start seeing [voter opinion] turn in May, when gas was $4.50 to $5 a gallon here," says JMM Research President Jim Moore. JMM Research is the in-house pollster for the official HSR campaign, but their previous polls were confirmed by the Field Poll, the state's most respected polling outfit, last month. 62% is a wonderful number, but I'm not overconfident - Prop 1(A) is going to be hard-fought struggle going into the November election. It's going to take a lot of effort and work to win this. The poll is quoted in the context of a much bigger article on how high gas prices are changing the American economy. The article makes many of the same points I made on Sunday - that only long-term demand destruction, accomplished through the provision of alternatives, is going to allow us to handle this crisis without economic disaster. Those who would point to the recent easing of gas prices as evidence that the crisis is over have missed the point entirely - gas prices have eased only because Americans started cutting back on their consumption. What that means is if the reduced consumption is not sustained and expanded, prices WILL rise again. Harvard University urban economist Edward Glaeser says there are limits to how much the U.S. can be expected to follow Europe and Japan. The U.S. population grew nearly fourfold in the 20th century, an increase that coincided with the rise of the automobile. Motor travel reshaped the country, allowing people to move away from the old coastal cities and transport hubs. In Europe and Japan, much of the population growth occurred before car travel took hold, so people are still clustered around old transport hubs. That makes it easier to forgo car travel. However, as the article points out, high gas prices are destroying exurban growth and sprawl and driving people into the "old coastal cities and transport hubs." And as Matt Melzer pointed out last month, California's population distribution patterns closely resemble those of Spain, where HSR has been an outstanding success. Demand from rapidly growing economies of China and India make lasting oil-price declines less likely these days. Despite the market's recent fall, prices remain above the prior inflation-adjusted peak of $106.15, set in April 1980. The high prices have been a drag on an economy already sagging due to the housing downturn and shaky credit markets. Auto sales have fallen, airlines are cutting back on flights, small trucking firms are going out of business, and transportation costs are eating into corporate profits. Much of the way America has come to live and do business is predicated on low energy prices. It's becoming clear to businessmen and government leaders around the world that HSR is necessary for a prosperous 21st century economy. But those in California who complain about grade separations in Menlo Park, or the Pacheco alignment, or the possibility of small cost overruns here and there, are deliberately ignoring those fundamental, big picture issues. California has lots of transportation needs, let there be no doubt about it. HSR won't solve them all. But by providing faster in-region commutes and faster in-state travel, using a sustainable, cheap, and potentially renewable energy source not dependent on high oil costs, HSR will help Californians reduce their oil consumption. As the WSJ explained, that in turn produces savings, jobs, and economic growth. Ten years from now when HSR is up and running we'll look back on this debate and wonder why there was any hesitancy at all. With a veto threat looming, lawmakers on Monday missed a deadline to replace November's $9.9 billion high-speed rail bond ballot measure with a better version. Rail supporters believe the clock hasn't run out yet. Lawmakers still have until Saturday to add a measure to the ballot, in this case Prop. 1a. The question is whether they could still remove Prop. 1, which will be included on guides mailed to voters that are scheduled to go to print soon. The Assembly believes that they *do* have that ability, hence the delay. The Secretary of State's office will likely make the final determination, based on their reading of election law. If it turns out the deadline to replace Prop 1 has passed, the Assembly should kill AB 3034 and go with Prop 1 as it currently exists, rather than add Prop 1A alongside Prop 1. I'm not exactly enthused about telling voters "No on 1, Yes on 1A!" because it's just not going to work. Still, it's a shame this uncertainty even exists. AB 3034 was proposed months and months ago; it was the topic of the very first post on this blog way back in March. The Legislature had plenty of time to act on it, but the delay - especially in the Senate, by Republicans such as Roy Ashburn - put its proponents up against the wall. Arnold's temper tantrum doesn't help matters. AB 3034 isn't necessary to high speed rail, of course. Prop 1 is a very good proposal and we strongly support it no matter what happens to AB 3034. It's another depressing reminder of the lack of urgency in our state on not just HSR, but mass transit and dealing with our dependence on expensive oil. I am confident Prop 1 will pass, but it will pass without very many politicians having shown leadership on HSR. Arnold wanted AB 3034 but prefers to throw a tantrum instead of getting it through the Legislature. Our two US Senators have been missing in action while their Nevada colleague gets $45 million to study a maglev system that'll never get built. Their leadership isn't necessary, but it would help reduce annoying problems like this. So we'll see what happens to AB 3034. The activism we engaged in over the weekend was valuable, and if anything needs to be ramped up to ensure Arnold does support HSR, whether it's through signing AB 3034 or strongly endorsing and campaigning for Prop 1(A). Look for more activism as the general election draws near. Finally, Speaker Karen Bass' office put out this video about high speed rail. It has some excellent quotes from Assemblymember Cathleen Galgiani, author of AB 3034, and it's especially gratifying to see her pushing the the cost of doing nothing is not zero frame I have been articulating since May. A spokesman for Assembly Speaker Karen Bass, D-Los Angeles, said the session was called off because of budget negotiations. The deadline for listing initiatives in the supplemental voter ballot is Aug. 16, but lawmakers have extended that deadline in the past. "The governor will continue to work with the Legislature to get the improved high-speed rail language on the ballot," Schwarzenegger spokesman Aaron McLear said. "There will be one high-speed rail initiative on the ballot, and the governor will be out campaigning for that." So that clarifies things somewhat. As I explained over at Calitics this morning, the state budget itself is running up against the same ballot deadline we are - and since the budget solution is likely to include a few ballot measures, Speaker Bass chose to prioritize that over AB 3034 - especially if the legislature can itself extend its own deadline. The quotes in the article, especially the one from Arnold's press flack, are also encouraging. Arnold seems to understand the issue and the need to ensure there's just one HSR prop. And of course it's very encouraging that Arnold will be campaigning for it - I think his term as governor is a failure, but let's face it, it's better to have him arguing for HSR rather than against it. "I respect the Governor's desire to finalize the budget and urge my colleagues in the Legislature to work out a compromise immediately so we can all move forward on the important issues facing California," stated Galgiani. "The Assembly is set to take up AB 3034 today and I expect it to pass with resounding support. AB 3034 is essential to Proposition 1 because it implements fiscal controls to ensure that the state bond funds are utilized in the most cost effective and efficient way. However, once it passes, I intend to hold the bill from Governor Schwarzenegger until the budget is finalized to ensure that Proposition 1 remains as strong as possible. With rising gas prices, congested highways and a rising population, Californians need more transportation options than ever." If AB 3034 is signed by the Governor and sent to the Secretary of State before Saturday, August 16th, (the last day for new measures to be added to the supplemental ballot on November 4th) Proposition 1A - and not Proposition 1 - would appear on the ballot. Proposition 1A's title and summary, legislative analysis and ballot arguments would be in a supplemental ballot pamphlet, and there would also be language included to alert voters. The short version: Saturday is the new deadline. I am doubtful there'll be a budget by then. But the sooner this is over the better, because it's time to start rolling out public activism for Prop 1(A). As expected, gas prices have begun falling. I will admit I did not think this would start until after Labor Day, as the fall is usually when the declines occur. But it began in July, and now we have some folks in the comments crowing that this means the crisis is over and HSR is no longer necessary. One point that needs to be made again is that demand destruction in the US (or even in Europe, where it is hapoening too) is not enough on its own to bring prices down, because it needs to be larger than the supply growth in the rest of the world to limit the requirement for further demand destruction and price rises, given that production is still largely stagnant. And the problem is that demand is not growing just in China and India, thanks to rapid growth, it is also growing massively in oil producing countries themselves (Saudi Arabia, Iran, Russia, Venezuela), which often subsidize gas and which can afford it given that they have a natural hedge against (the subsidy gets bigger when oil prices are higher, ie when their own income is bigger, and the income growth is larger than the subsidy growth for those that export any volumes). The phenomenon of peak oil is what's at work here, and it helps explain what's going on. As the supply of oil peaks, it becomes more difficult to boost production to satisfy growing demand. The price of oil will rise unless supply matches it - which as peak oil demonstrates, it can't - or demand will be destroyed. Demand destruction is good, but only if it happens through the provision of sustainable alternatives. Without alternatives to driving or flying, demand destruction is merely destructive, throwing economies into severe recession as people must reduce their oil consumption but cannot turn to anything else to make up for it. 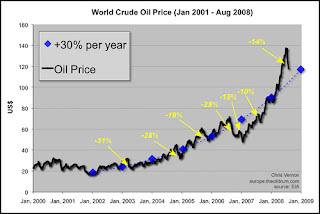 What happened recently is that for various reasons in early 2008 - concerns about war with Iran, the declining dollar, and perhaps some speculation, the price of oil rose above the trendline. Now we're seeing some of those pressures ease and the price is starting to fall, especially due to evidence of demand destruction in the US. Problem is, if people start upping their gas consumption, prices will resume their upward march. The only solution is long-term demand destruction. But it's STILL above $4 in most of California. And that's still far too high for most people to afford. It's been my belief that $3/gal was the true tipping point - when that price was reached and sustained for the first time in California, in 2006, the housing bubble began to collapse. And the downturn began in the places most dependent on cheap oil - exurbs like Modesto, Moreno Valley, Stockton, etc. High speed rail is one of those long-term solutions that will provide "good" demand destruction - the provision of alternatives to oil that enable economies to grow and people to move around. We don't support HSR because gas prices spiked in 2008, we support it because gas prices are on a permanent, long-term increase, despite whatever intermediate fluctuations occur - and the only solution to this that saves us money and sustains a prosperous economy is non-oil mass transit like high speed rail. In the summer of 2004 gas prices soared to the record level of $2.50 in Seattle, where I was living at the time. By January 2005 it had dropped to $1.95. But that didn't change the long-term upward trend, and so in summer 2008, in both Seattle and California, gas prices hit $4.50. We may see $3.50 or even $2.99 by the November election, but the next increase always wipes out that savings. Next summer may well see us break the $5 barrier (diesel already did so this year). Three steps forward and one step back is still forward movement. So to those who point to $4.15 gas and say "neener neener," the joke is unfortunately going to be on you when we hit $5 in 2009. I don't know about you all, but I'd rather we got to work building high speed rail so that we have an alternative to oil sooner, not later. We've already wasted three decades. We have no more time left to lose. At one point, asked about his support for high-speed rail, Obama lapsed into what was almost a comedy routine. All he needed was a fake brick wall behind him and a two-drink minimum. "If you think about the Midwest, think about right here, what we've got is all kind of towns that we could connect," Obama said. "All of these cities are, they basically take in the air about 45 minutes to an hour to fly." "But by the time you get to the airport," Obama continued, "take off your shoes, get to the terminal, realize that your flight's been delayed two hours, go pay $10 for a cup of coffee, and a sandwich for another $10, come back, you get on the plane, you're sitting on the tarmac for another 25 minutes, you finally take off, you're circling above the city for another half hour, when you land they can't find your luggage, and then you get to where you're going -- by the time it's all done it's a five-hour trip! …So the time is right now for us to start thinking about high-speed rail as an alternative to air transportation, connecting all these cities and think about what a great project that would be in terms of rebuilding America." What I really like is how well Obama articulates high speed rail as not just a neato piece of tech, not just a solution to our climate and energy crisis, but as something that just plain works, and can give workaday people a better way to travel. High speed rail saves time and money. It's a populist and smart way to push back against the Republican lie that oil drilling is going to help solve the crisis. Obama is showing that he understands quite well Van Jones's argument that we must move from opposition to proposition. It is not enough to fight against the idiotic drilling policy - you must also propose a better solution. High speed rail is one of those better solutions. Of course, it would be great to pin Obama down on whether he will fight for federal money for the California high speed rail project, and how much he'd budget for it. The US budget deficit may be as high as $500 billion next year, and while the traditional media gives Bush and the Republicans a pass on this, they won't do the same for Obama and the Democrats. We're going to have to continue to fight to bring money to California for HSR. But no money is going to come at all unless we pass Prop 1(A?) this November. The State Senate today finally passed AB 3034. It will now return to the Assembly, which will consider the Senate's amendments and send it on to Arnold Schwarzenegger. Despite their earlier opposition, several Senate Republicans voted for AB 3034. They include Roy Ashburn and Dave Cogdill, who have previously been less than supportive of HSR. Additionally Jeff Denham, Tom Harman, Bob Margett, and my own Senator Abel Maldonado voted for AB 3034. What changed? The Senate amended the bill yesterday to provide more oversight, including a "peer review" committee (see the bill text for details) and mandating that a revised business plan be produced by September 1 - not October 1 as previously suggested. Also, Monday is the new deadline for altering the Prop 1 ballot language, contrary to reports from mid-July that suggested the deadline had already passed. This bill will ensure that the High Speed Rail Bond on this November’s ballot contains important environmental and fiscal safeguards and accordingly will help assure voters that their money will be wisely invested in a system that can dramatically improve California’s environment while providing mobility options that improve our competitiveness and quality of life. That's more like it. Good to see the Sierra Club keeping focus on the value of HSR. Let's hope they will endorse Prop 1. This good news, however, is tempered by remaining obstacles. The Assembly may not be pleased with the changes the Senate made, which include Leland Yee's move to secure the "spine" from SF to LA and Anaheim. But the Assembly is under the gun to approve the changes by the Monday deadline. Time to call your Assemblymembers and let them know that they ought to back AB 3034 as-is, and send it onto Arnold for his signature. And that part is also tricky. Arnold is throwing a temper tantrum right now, claiming that he'll not sign any new bills the Legislature sends him until a budget deal is done. Funny thing about AB 3034, though - Arnold himself was its driving force, as the bill primarily exists to satisfy many of his demands about the HSR bond. Some Republicans who praised Arnold's silly move - like Jeff Denham, who said most bills "do more harm than good anyway, voted for AB 3034 anyway. More importantly, AB 3034 required a 2/3 vote to pass each house. 2/3 just so happens to be the amount needed to override a governor's veto. So if Arnold continues his hissy fit, AB 3034 can still become law anyway. All in all, it's a very good result. Props to everyone who helped pass it through the Senate - they understand the need to keep our eye on the ball and get HSR built. UPDATE Here is what I'm told about how the ballot stuff works. Apparently the Legislature can remove Prop 1 and replace it with AB 3034 - as a new Prop 1 - if they act by August 11, which is Monday. They must both remove the existing Prop 1 AND pass AB 3034 for this work, and AB 3034 would go onto the ballot as Prop 1. If they miss the deadline, then AB 3034 would go onto the ballot as a supplemental prop - Prop 12 or, god forbid, Prop 13. It's been shown that this might cost 5-10% points in support, which could be fatal. Also, having two HSR props on the ballot would be incredibly confusing and might well lead to both failing. The lesson: This last-minute stuff is really not good policymaking. This needed to have been resolved at least two months ago. If the first scenario cannot be accomplished - removing the current Prop 1 and replacing it with AB 3034 as Prop 1, then AB 3034 should be abandoned and groups should move to support Prop 1. If Assembly Bill 3034 is not signed into law by Monday at 5 p.m., voters will be forced to consider a measure which lacks information considered critical to garnering support. While the Governor may be loathe to reverse himself so quickly, Florez – who is sure Schwarzenegger could not have been aware of every possible ramification when he made his latest pronouncement – encouraged him to look to his own words on the issue. Sounds like the ball's in Arnold's court now. This bill would require the bond measure to appear first on the November 4, 2008, general election ballot and to be designated as Proposition 1 1A. The bill would specify the ballot label and title and summary to be used for the measure. Apparently the revisions also have more flexibility on funding minimum operable segments, but as I read it the "spine" from SF-LA-Anaheim is still prioritized. Anyone have a better reading? Put it in the comments. The most important news of the week isn't about a lawsuit. It's the report from a top British government climatologist arguing that global warming is going to happen faster and at a higher temperature than previously assumed. A 4C increase - equivalent to 7° Fahrenheit - would have a devastating impact on rainfall patterns, agriculture, and sea levels. Even if 4C is the upper end of the scale, the more widely accepted 2C figure is damaging enough, and a sign that we need to delay no further on implementing global warming solutions. According to the Final EIR 63% of intercity trips over 150 miles in California are taken by car (scroll to page 12). This is a major factor in causing most of California to be out of compliance with state clean air goals. Given that HSR would be much faster than driving between California's major metro regions, and will likely be less costly as well by 2018, HSR would make a significant dent in those car trips and therefore in the pollution they spew. 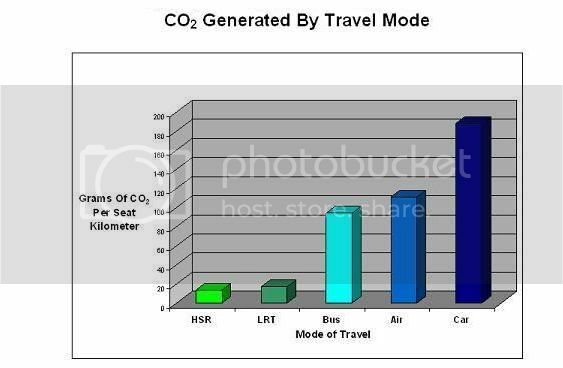 HSR will also help reduce air pollution. A 2006 Fresno Bee article explained that lung problems have soared among residents in recent years, and the San Joaquin Valley Air Pollution Control District estimated that to counter this trend, the region needed to eliminate 400 tons of pollution per day by 2011. High speed rail would help accomplish that task. The California Air Resources Board in June issued its draft scoping plan for implementation of the AB 32 carbon reduction goals. They cited high speed rail as one of the methods the state will need to use to achieve the targeted reductions. Those who are willing to jeopardize passage of Prop 1 by suing because they didn't get their way on the alignment decision or because they don't want safer, cleaner tracks in their neighborhood are overlooking all of these benefits. This isn't anything like oil rigs on the Alaska North Slope or on the California coast. The worst that might happen are tracks through some ranches near Pacheco Pass. The trains will tunnel beneath the pass itself and Pacheco Pass State Park. If that's the price we have to pay for achieving important carbon reductions, I think it's well worth paying. Because California has failed for decades to act on climate change and energy independence, we are past the point where we can make easy choices. Everything we do to solve the energy-environment-climate crisis will have a possible downside. What we need now is leadership and action. We need to get started on our long-overdue high speed rail project and pass Prop 1, because if it fails at the polls, it's not coming back to the ballot for a long time. Van Jones, who knows a thing or two about environmental policy, is exhorting audiences to move from opposition to proposition. Without it, he argues, we have no hope of stopping the right-wing's destructive environmental policies. We don't have the political room to be fighting each other over the small differences, and we certainly don't have the time to be suing because someone didn't get their way. It's not easy to advocate for mass transit in California. Anytime a project is proposed, parochial concerns often derail even valuable projects - witness LA County's MTA tax plan. We have a pathetic rail infrastructure partly because few are willing to accept a compromise in the interest of investing in a better system. How long will we go around in these circles before we finally decide to act? HSR is one of the most environmentally friendly projects California has considered in a very long time. It won't solve all our problems, but it's the necessary first step. It's time we rallied together to support the passage of Proposition 1 and take the lead in fighting for a better 21st century environment for all Californians.